Sakhi Sarwar is a town in Dera Ghazi Khan, Pakistan. 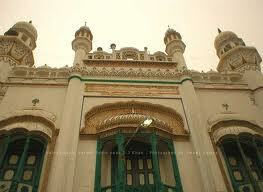 It is named after a Muslim Sufi saint Hazrat Syed Ahmad Sultan, also known as Sakhi Sarwar. Syed Ahmad Sultan also known as Sakhi Sarwar, Lakh Data, Nigah wala Pir and Lalan Wali Sarkar, was the son of Hazrat Syed Zain ul Abiden, who migrated from Baghdad and settled in Shahkot, near Multan in 1126 A.D (unconfirmed). Which is now called Sarwar Shahkot.The Holy shrine of Hazrat Zainul Abiden is in Sarwar Shahkot with the tomb of his second wife Hazrat Bibi Aysha, the mother of Hazrat Sakhi Sarwar and Abdul Ghani . His first wife is Bibi Aimna, the mother of Hazrat Sultan Qaisar(Tomb in Bukhara), Hazrat Syed Mahmood(Tomb in Pakistan), Hazrat Syed Sairra (Tomb in Bukhara) . He studied from Syed Muhammad Ishaq, known as Miran Badshah who came from Iran and settled in Lahore during the time of the Tughlaq dynasty and is buried in the courtyard of Wazir Khan Mosque in Lahore. Syed Ahmed later went to Dhaunkal, Wazirabad. The tomb of Hazrat Sakhi Sarwar was built in the 13th century in Sulaiman Mountains, 35 kilometres (22 mi) from Dera Ghazi Khan city. It is located in a small village named Muqam. Later, Mughal king Zahir-ud-din Muhammad Babur amended his tomb. It is a unique building of Mughal architecture. Thousands of people from all over the Subcontinent come here on the Annual Celebrations of Birth of Sakhi Sarwar in March every year. Sangh Mela, is a Vaisakhi fair during March and April, is celebrated in Sakhi Sarwar by people coming from Jhang and Faisalabad since centuries. This festival is celebrated by Hindus and Muslims especially at the time of wheat harvesting and at some places it is called as Basant. Throughout history, a large number of followers coming from different religions became the followers of Sakhi Sarwar. Max Arthur Macauliffe, a colonial office appointed in Punjab, observed in 1875 that not only Muslims but Hindus also visited the shrines during the [urs]. In the 1911 census of India, 79,085 Sikhs reported to be the follower of Sakhi Sarwar. The annual Dhaunkal fair, Jhanda fair in Peshawar and Kadmon fair in Anarkali, Lahore are also connected with Sakhi Sarwar. Many villages in Punjab, India have shrines of Sakhi Sarwar who is more popularly referred to as Lakha Data Pir.